Institutions are the organisations and people whose operational processes and practices enable or constrain media production and use. 1. Petty makes a distinction between what people ought to know and what people want to know (or be entertained by). a) How does Petty suggest this happens? b) What things do you think people ought to know from the Media? c) Do you think the Media supplies this? Or do you think the Media concentrates on one of these more than the other? Why do you think this might be? a) the brief history of the media opening segment. b) the content machine which follows and the representation of news values. c) advertising as a milking machine. d) talkback radio as a toilet. e) the government as a panel game. 3. How does Petty represent each of the media forms: print, radio, TV, film and digital? What are the main visual and sound elements in each of these? 4. A number of Media critics talk of information overload or information “white out”. Marshall McLuhan and Jean Baudrillard talk about too much information just becoming noise while Bruce Springsteen writes about 57 channels and there’s nothing on. a) In Human Contraptions Media, what do you think Petty has to say about this? b) Why might this happen? 5. Draw, build or otherwise create your own Media human contraption (if you can’t draw, you might like to do this in the form of a diagram or “family tree”). 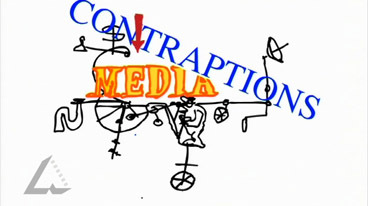 Your contraption will need to show the interconnections that you think there are between the various forms of media, society and “reality”. In your work you will need to include, amongst others, the audience, the owners of the media, the creators of media products, their creations, the government and the people.